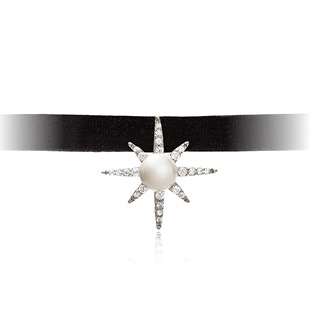 Crafted in pure solid sterling silver with a white rhodium finish, this shining star pendant is set with luminous fresh water pearl and sparkling cubic zirconia and presented on a black velvet choker. Shine your light on the world with Keiko Uno Jewellery’s ‘North Star’ collection. Like the sparks of imagination from which dreams are formed, stars represent limitless possibilities and infinite wonder. The North Star is about direction and purpose, always constant and dependable. Stay centred, in an ever-changing world. And let your truth shed magic and inspiration to the world.